No backyard bird feeding station is complete without feeders to attract those tiny flying jewels of the garden, hummingbirds, and the equally beautiful orioles. In the wild, hummingbirds have two major sources of food: flower nectar and small insects, such as gnats and spiders, which provide protein. They pick their insects from flowers or grab them out of the air as they dart around looking for nectar. Hummingbirds readily use a nectar feeder, and since ninety percent of their time is devoted to finding nectar, you really should have one or more of these specially designed feeders in your yard. When you shop for a new hummingbird feeder, look for: capacity. 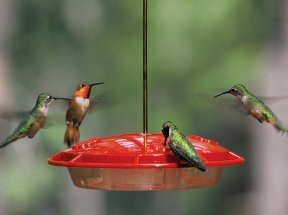 Choose a feeder that matches the number of hummers available to feed in your area. Large sizes may be tempting, but it’s better to start with a smaller feeder to reduce waste and the likelihood of the nectar going bad. Hummingbirds are so acrobatic; they can eat on the fly. A perch is not required in order to dine. However, a perch may offer an incentive to hang around. Hummingbird feeders are usually made from plastic or a combination of glass and plastic, the variable being the nectar container. Glass containers are more durable and scratch resistant, but plastic won’t shatter if it hits the floor. Fill the feeder with a commercial hummingbird food or a simple nectar solution of one part white, granulated sugar to four parts water. This ratio approximates the sugar content in many flowers that the hummers favor. It isn’t necessary to add red coloring since hummingbird feeders have a varying amount of red on them, which will attract the birds. You will be doing lots of filling and cleaning because nectar should be changed every 3-4 days, especially in hot weather. Make sure the feeders you purchase come apart easily to be able to thoroughly clean them. There really is no limit on where you can locate a hummingbird feeder, even an apartment balcony or office window. However, just because you put it up does not guarantee its use. If you do not see hummingbirds in local gardens or neighboring parks, they may not be in your area. However, it could simply take a little time to establish your feeding station among resident birds, or you my live where you will have them only during migration. Hummingbirds are very territorial and don’t like to share your nectar with other hummers. This can limit the visitors to your feeder. If you want to attract more, “add” more feeders. Place them out of view of each other, or so close to each other that no individual hummingbird can possibly defend them all. You will have best results if you get your feeders out first thing (April 1st) in the spring, but don’t hesitate to put them out in midsummer. Then, as the weather gets cooler, continue to feed through the fall until the hummingbirds no longer visit. That is the indication that the local population has gone south and the migrant birds have passed through your area (generally October 10th). 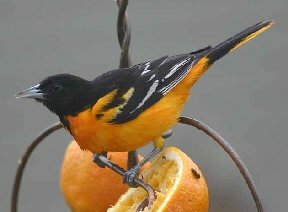 For orioles only: Orioles have become such constant visitors to hummingbird feeders that manufacturer now produce large capacity feeders with orange, instead of red, colored parts. If you plan to use an oriole feeder, choose one that includes similar features to the hummingbird feeder such as an ant moat and bee guards. Start early to catch the migrating males, enticing them first with fresh orange slices set out close to the nectar feeder. The same mixture of sugar and water that you use for the hummers will work for the orioles as well, or use commercially available orange flavored nectar. Sometimes it seems like a lot of fuss and bother, but when the first fascinating hummer or gorgeous oriole shows up for a snack, you’ll realize all your efforts were well worth it. Enjoy your birds!